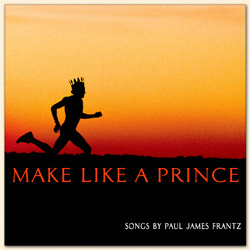 Make Like a Prince is a debut collection of songs written by Paul James Frantz. Built on a jazz / cabaret foundation, the songs on this sampler CD branch out into a variety of styles. The topics range from traditional torch songs to politics, mortality, dysfunctional relationships and the absurdity of modern life. Paul's wry humor shines throughout. There are songs about both gay and straight relationships. The message comes through that at the end of the day, it's all the same. Most of the songs on the CD feature Paul's vocals. Chavé Alexander performs "C'mon Santa" (track 5) and "Taking Charge of My Dream" (track 13). Shannon Koon joins Paul for a duet on "Slidin' Scale" (track 4). The singers perform with a jazz trio. 12. I Say, "I Know"
Chavé Alexander Vocals on "C'mon Santa" and "Taking Charge of My Dream"
Shannon Koon Vocal duet with Paul on "Slidin' Scale"
The CD was recorded in 2008 at Laughing Tiger Studio in San Rafael by recording engineers Matt Cohen and Rick Vargas. It was mixed by Matt Cohen and mastered by Mike Bemesderfer. Production was by Paul James Frantz and Candace Forest. Sean Bart was the music director. The cover art, disc art and packaging were created by Deb Lehman of Hopping Media. The cover art incorporates an image used with permission of Jupiterimages Corporation.